The Bluebirds are Nesting...: The World Within our Walls. Domestic Bliss. The World Within our Walls. Domestic Bliss. We are looking at lots of ways to make the world within our walls a safe and happy retreat from the world. A big part of this for me is to do with standards i.e. the worlds standards and ideas are not necessarily our own and at least at home we can stick with what we believe to be true and right. But there is more... we can decorate and run things in a way that makes us happy and our hearts sing! For each of us there will be different things that are the little touches that we really adore. It might be because our Grandma had pretty curtains in her kitchen or a floral under sink skirt or perhaps she wore an apron so even now the sight of an apron makes us happy. Vicky has been adding the finishing touches to her new pantry. Looking back to times when there was no K Mart and little money women still found a way and cut newspapers into pretty lace trims for their pantry. They painted cans and jar lids to make canister sets. They sewed curtains from feed bags and used wooden boxes for seating. We just love to feather our nest and make it nice. 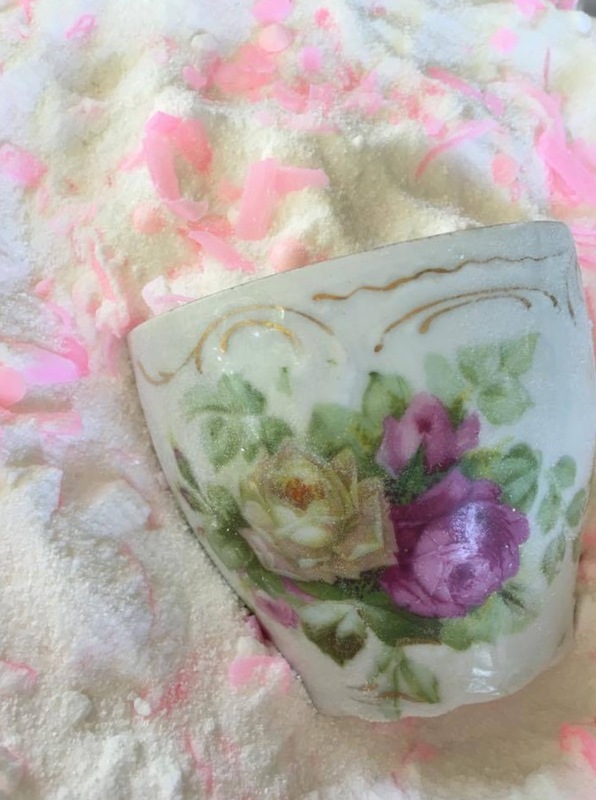 This business of making the ordinary beautiful was called "A woman's touch." Apart from being warm and comfy we all have little things that make us feel happy and content. Each member of the family will have things that they love and these are usually easy to spot. Happily Andy loves clean sheets and the way linen smells when it comes in from the line as that makes us both happy. He likes a coffee mug and his favourite brand of coffee. He likes giant bath towels, leather luggage and hats. In his office he has vintage trunks and he has a music room full of instruments and recording stuff. We love a soft throw on the lounge in winter. And soft lighting in the evening. What I am trying to say is let your home reflect the people who live there. If your daughter loves purple paint the walls purple! Let each person flourish in their space. I love to make ordinary and boring things nice. These things just make my heart happy! 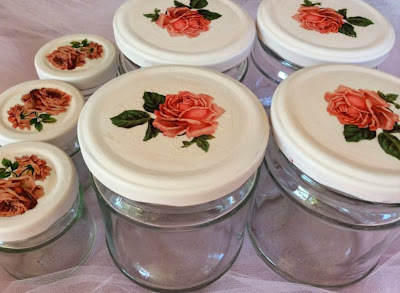 They might be stupid to some but my heart just melts over jars for the pantry with painted lids or decals on the front. These are just baby food jars. I made the blue set for Chloe and she uses them for vitamins. This means I am never going to fit in with many home decorating fashions. There was a recent one where homes looked like dental surgeries. You don't have to squash everything you love to fit in to some current trend! It is your home, your sanctuary.... you want to feel comfortable in your own home! Some of the most beautiful homes I have even been in haven't been new or grand in any way... they have just been homely. You feel comfortable there. There is love and peace inside those walls! If I see a tablecloth on the table or a row of canisters or jars I think oooh I have found a friend! Little touches speak volumes to me and they really add up. Sometimes I make up my own laundry powered and make it pink! I love beautiful kitchen towels and pot holders. I love netting throws and covers for picnic or outdoor food. If I make a cake I put it on a cake stand, it just seems more special! Even cleaning cloths are nicer if they are a bit pretty. I can actually be happy cleaning! This one was made by Kelsey as a gift. So gorgeous! I also love to see time worn things that someone else has used... like a rolling pin that is really old or an apron that has faded. To me this is so romantic! If it is dark or colourful I paint it! I spray painted a whole heap of random tins and used paper napkins to decorate the tops and then I had a "matching set." Decorating, straightening, cleaning and making.... being happy and content at home is so lovely. When you are busy and loving it you are also setting the tone. What is actually better than coming through the door to a happy home? Don't let anyone tell you that your work at home is a waste of your precious time. You are creating a thing of beauty and a resting place. There is no place like home! It is our sanctuary and our launch pad into the world too. Don't underestimate its power or importance. When the kids walk in the door coming home from school and they smell baking... this is beautiful! My husband will open the door and say "what is cooking, what smells so good!??" He is so happy to be home. To me these things are a bigger success than an academy award! What are the homely touches that really make you feel wonderful? Have you had that experience where you organise or decorate something and you love it so much you keep going back to admire it? Is there an area that needs a makeover because it bugs you? A little bit of cleaning or organising here and there soon adds up. A few little touches of beauty soon add up too! Labels: The World Within our Walls. Barb says thank you everyone for the messages! She is still in hospital but ok. I hope she will be home soon! Could you please explain how you decoupage the canisters. Do you just use little nail scissors and slowly cut the intricate shape out of the napkin, and then Modge Podge to stick it on? They look so nice!! i am still working out how to make my house a home, i love my home but no one else does; i live by myself now so working out what i like & don't like is taking it's time; i do love anything old, vintage, antiques etc. i'll get there eventually, house is slowly being renovated & have lost my lounge room for the moment. stuff is stored in it. love your canisters & jars, so pretty! Selina it is hard when things that we love are packed up and out of site or tucked away in a room as we do work on our houses. We have downsized and a lot of my 'pretties' are still in storage. The plan was to spend some time after Christmas starting to work my way through boxes of items that are still in storage but my mother in law's passing has put an end to that for the time being. I know this too shall pass so focus on that. I'm a blue and white china girl and it features throughout my kitchen, living and dining areas. It makes me happy. I'm a doily girl too, probably because my mum crocheted some that I have. I love the curtains open to let light in. I love to have a dish cooking on the stove that is appreciated when someone walks through the door. My husband has remarked that he loves the smell of his clothes after they've been washed in OMO and yes, clean linen is lovely on a neaqtly made bed. I love everything up off the floor, no clutter lying around (which is easy now that my girls are no longer home). I deal with bills as they come in then they are filed, rarely do I lose paperwork. Nearly everything in my home, that is on display, has been given to me for birthdays and Christmases. I'm not into the display home look with bits and bobs that mean nothing to me. Dear Joolz, I started collecting blue and white china when I was about 13. I had a glory box and started op shopping them plus collected doilies! My weakness is wind chimes. All shapes, sizes and colors. Spring and fall we get plenty of wind. I have a couple very delicate ones that must be hung indoors or they would break the first day. I love the end of season sales when they are generally marked 50% off. Even though it's supposed to be winter we've had 70 degree F temps for a week here in California and another week of this weather at least is forecast. I can have my bedroom window open 24/7 and have wind chimes hanging right outside so I can hear them with the slightest breeze. Dear Annabel, thankyou for reporting back re: Barb, hope she's back home very soon. 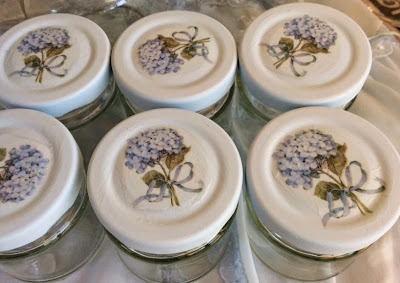 I love your painted tins and lids , so fresh and pretty!As are the decanters and pink floral cleanign cloths. Kelsey's cleaning cloths look sweet too and so beautifully presented . I love floral tablecloths and China but I also love my German white dinner set Ive had for 40years , and I have tea and coffee pots milk and sugar containers and platter and tureen that matches.It has a pretty filigree edge all in white .Recently I started using it everyday and my daughter said it feels very special , when she visits. Also love the special gifts of ornaments and china given to me by famiyl and freinds over the years , my mother's walnut cabinet and some of her Lladro that I inherited . Artifical flowers in vases that my late father gave me in 3 places in our home. Our pink bathroom that is as old as the hills , with floral china knobs on the cupboards and it's lovely shaped bath. The artwork givento me that I wear and think of the giver .Candles given handmade and bought,and much more. The warmth that salt lamps bring in the dark . And I do wear aprons a lot :-) and I like the beds made and rooms to look tidy. Ive just pinned the worn off edge of my beach towel to sew and make neater tomorrow,inspired by you hehe. Dear Maria, I just love plain white china. My main stuff is plain white with kind f little mouldings on the edges. Your Mums cabinet sounds just beautiful! Much of what you mentioned are things that have a lovely memory attached. I love this. I have a little mermaid ornament of my Nans she used to sit it in a bowl of flowers and I often get her out and do the same. I have also sat her on a cake! Oops apologies ,I had a glitch as I was on my phone when I typed my post above should read as follows..
From the sentence starting Artwork...that was painted by my daughter adorns several walls , and Jewellery given to me by family and friends over the years I like to wear and think of them . Annabel, what a beautiful, heart-warming post. You are so loving and positive and it shines through your posts. I love your canisters, they are so pretty. My goodness Kelsey is clever. 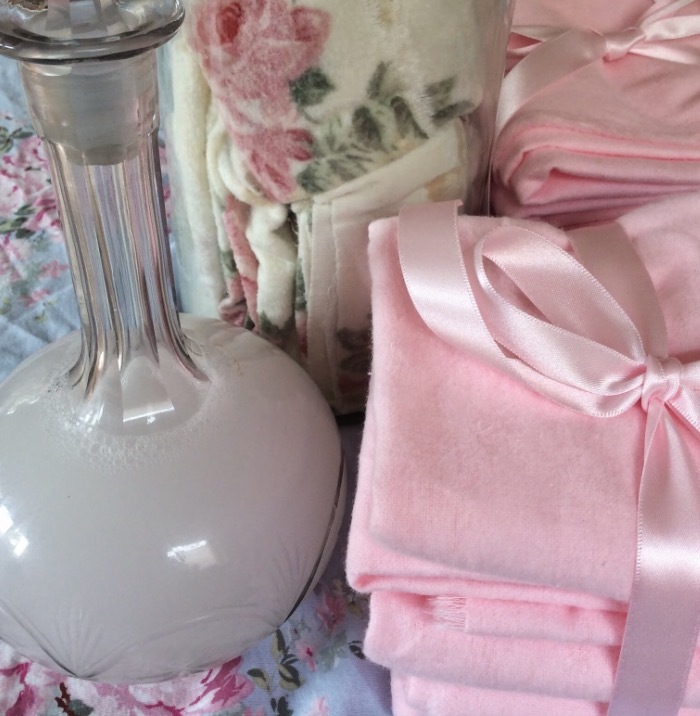 Her cleaning cloths are so pretty and what a gorgeous and practical gift, just wonderful! I am lucky my husband and I are on the same page, we like the same brand of coffee, antiques, and family heirlooms. I have been blessed with a lot of my late grandparents' furniture. I was very close to them, but now we as a family get to sit at their dining table and that makes my heart happy. I love flowers, fresh linen and freshly cut grass, washing hanging in the sun and the sight of my pot of herbs (I hope to have more). Thank you for showing my album the other week. That was so kind of you! You are so generous and encouraging to us all and I am very grateful to you. Dear Bridge, I have my Nans dining table and I love it. I am so glad to have things in my home that are from family. Herbs growing is a lovely sight. Because I have herbs at the back door I use them so often. I water them with the water from the kitchen when Im waiting for hot water I fill a jug. It is kind of watering them for free! I love your album! I love the bluebird of course! -My “Old Glory” American flag hanging on our front door. This is the first home in about 16 years that I have the liberty to show my American patriotism without fear and with joy. -My vintage Coca Cola crate filled with faux rosemary on top of my refrigerator. -My World War II Philippine souvenir shoes that I bought in America at flea markets, hanging on a wall. One’s red, one’s green, and one’s yellow. All the soles/heels are carved into little huts, and one of them was even signed by the giver and addressed to the recipient. I actually found the recipient online. She was a WW II nurse and her husband gave his life for my freedom. Since we lived in the Philippines off and on for 16 years, the shoes are very special to both of us as my husband is also a WW II buff. -The Anniversary Plates I’m collecting and am hanging on our bedroom wall above my life verse that I color-penciled onto the wall: “And let the beauty of the LORD our God be upon us: and establish the work of our hands, yea, the work of our hands establish Thou it” (Psalm 90:17). -A variety of gold frames, hanging in our master bath, each with a different Hawai’an barkcloth fabric behind the glass. Hmm. Did you ever think to frame fabric?! Me either! Got the idea from a magazine umpteen years ago. -A nice clock hanging in E.V.E.R.Y. room in our house, even in the garage! -My husband’s ball cap collection organized by clipping them to cafe curtain rings and sliding the rings over a rod in the walk-in closet. He LOVES this! Me, too! -A happy husband fills my home and my life with peace, love, gratitude and joy! Ahhh. Annabel, I thank the Lord for my home! Dust ruffles..... should you blog again then instructions please! I need to make longer ones now as we raised the bed. I could use what I have and sew an edging to lengthen it. Chloe has the most amazing one from a thrift store... 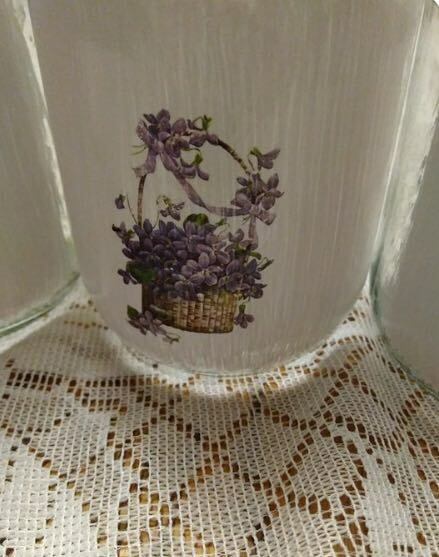 I have seen lace ones too which I love.... so this is a project for me. Tidy closets, beautiful linen press, preserves lined up... you reminded me to mention these! 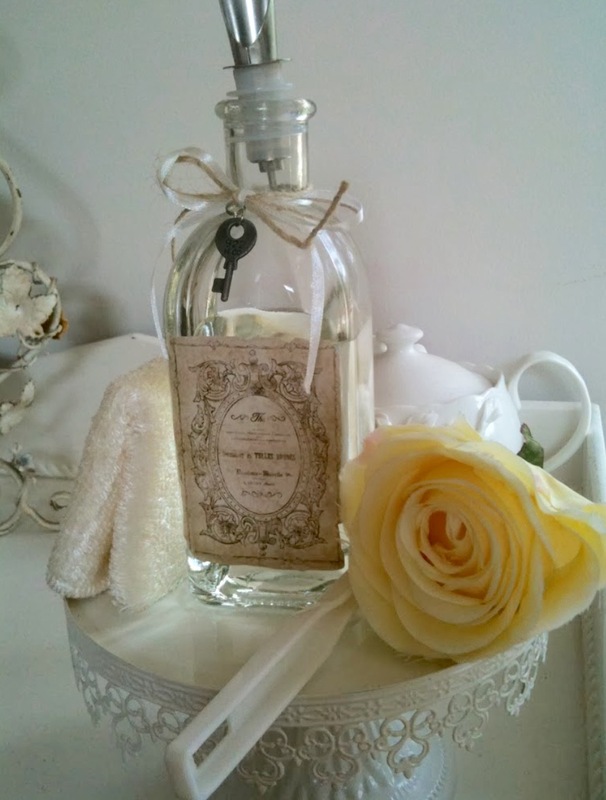 Annabel how pretty are those jars of both yours and Vicky's, the cleaning cloths are divine and they look so special tied with that beautiful satin ribbon. 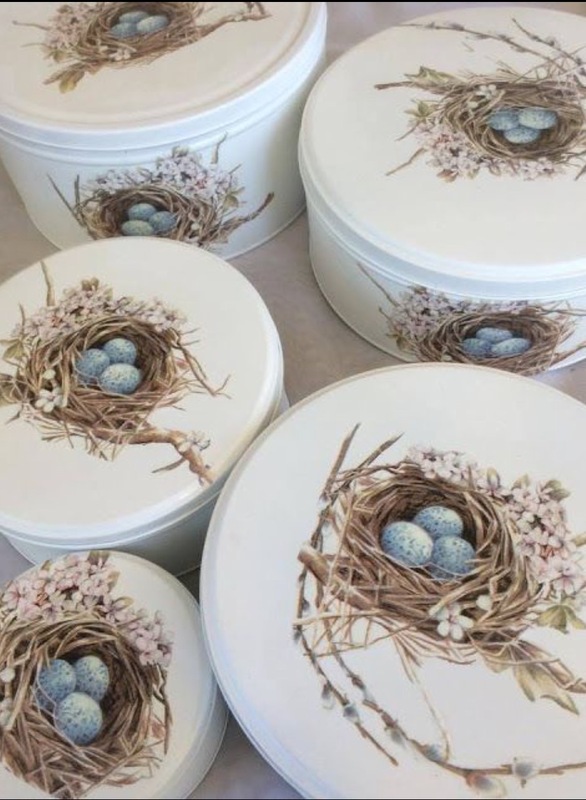 The tins are gorgeous too and it gives us all some good ideas to do things that are low cost but look so pretty. 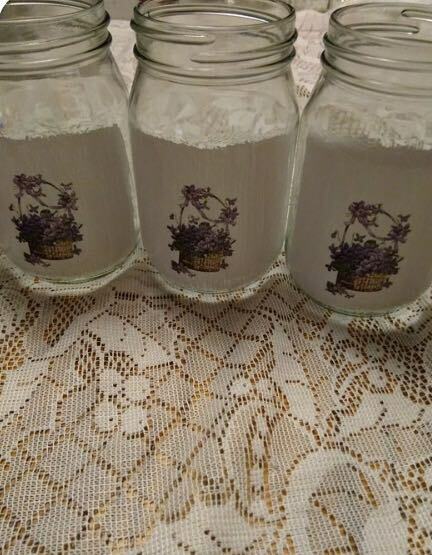 With the jars you could probably use pictures from magazines after cutting them out to decorate them with as well with a clear lacquer over the top. 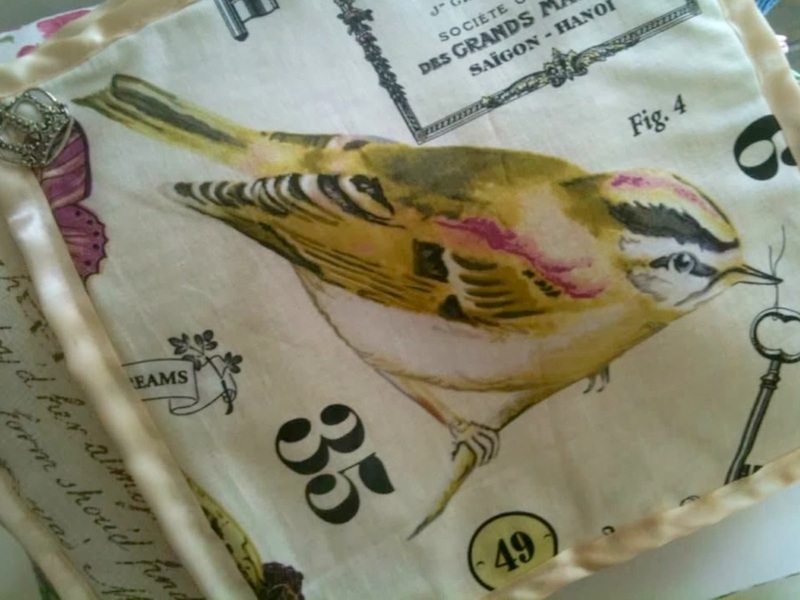 The things I love to do to make things homely is to make my own curtains, table placemat, coaster and napkin ring sets, tablecloths and buffet and entertainment unit runners. Currently I have curtains I have made myself out of a quilt cover with a lovely bright floral fabric in the laundry and toilet areas. It makes me smile to walk in there as it looks so bright and cheerful. In the hallway I have lovely French inspired fabric curtains which block out the light when we sleep and also keep the heat in a confined area from our fire in winter. The kitchen I have a mixture of tablecloths I swap over depending on my mood with some being floral and some French inspired fabrics. Currently I have some flannelette which I saved from some old pyjamas that is hardly worn that I want to turn into double layered cleaning cloths and also into some soft flannel tissues too. From old pillows I also saved the cotton coverings from them and soaked and washed the fabric and will turn those into some nice white fabric table napkins. Can you tell I am in a reuse and upcycle what I have mode at the moment :) . Now I just have to find the time to do it between replanting and amending our vegetable garden beds. I think you re right! Images from a seed catalogue or gardening magazine would give flowerpot stick on lids etc.... it is all the same once sealed with varnish! So many possibilities! I think quilt covers, sheets, any linen is such a wonderful source of fabric. With the wedding we are collecting old embroidered linens. You should see some of the tablecloths... so much fabric... I am already plotting what to do with some of this after the wedding! To me embroidered tablecloths would make gorgeous curtains too! I also have pyjama pants in flannelette with the exact same thing in mind! This is such soft material I love it. Heat packs is another thing.... the softness is nice on them too. and bordered them with some fabric scraps, put them in a basket on my cabinet. Softened up the cabinet and look pretty in the basket. Annabelle, I love the way you can take something that a lot of people would throw out as rubbish and turn it into something beautiful! You give me the best ideas. When I told my daughter that I decided my way of decorating is a combination of English Country and Early American, she reminded me that they are pretty much the same. Since the Colonies were British. I love many of the same things you do but I also love lots of wood (my husband does, too). I have read a number of articles here in the States about how the younger generation (basically age 35 and below) do not want anything old or vintage. They don't even want precious items that belonged to their parents or grandparents. I think it is a sign of the lack of connection most likely caused by lots of time spent with technology and fewer face to face evenings spent with family. I love English cottage gardens especially Hollyhocks and Foxgloves... floral china... I love it all. I also love hanging the laundry and was taught to hang like with like from largest to smallest, etc. I confess that when I see a line of laundry hung all higgledy piggledy with a sheet next to a sock next to a shirt, I think that the lady doesn't care. I understand the thing about how linens FEEL and also smell! So lovely! That is interesting about the order of line drying. I can see my line out the kitchen window. I like it to look nice! I hang the sheets at the front which I can see and the higgledy piggedly stuff behind that so it looks neat to me even if no one else... Also if I am washing my pink floral sheets or floral tablecloths I just think they look heavenly for the whole day! What a lovely idea, to beautify your home. Annabel I love how we are so similar in so many ways, yet so different in others. We both have white ceilings and walls and I have white floor tiles throughout my sub tropical home. I love my old furniture that is made up of dark timbers. The grain of the wood is just so beautiful. I love colour and lots of it. I am so glad that I can do patchwork and can make up covers for old furniture and turn beautifully made pieces into parts of my home. I love that Bluey has made me some beautiful furniture over the years. These pieces have been well used, telling a story of their life within the walls of our home. I love my home to be clean and fresh and well aired. I love to have home baked goodies in the tin, ready for hungry visitors. I use the china that I have inherited or been given over the year. My mother was given a beautiful dinner set for a Wedding present 55 years ago. She still has every piece of that set. I dont think I have ever seen it used. As I use my china, and always have, it is very mismatched but that is part of its charm. I love that our home extends to an outdoor area. We have greenery, seating, storage and cooking facilities. This too is a well used area of the home. Our climate dictates the need for such an area. Being 'home' is a wonderful place. Being home make life very good indeed. I also LOVE outdoor dining and living. Yes, like a room. It is an extension of the house. I guess this is the most well aired room hahah! I am so glad you mentioned the mismatched china, Jane. That is one of my things. I just love to buy one plate, just because I like it. Then, when we sit down to dinner, we all have different plates, but I like every one. My grandmother used to do this, so I guess I got the idea from her. I have read through this great list of everybody's homey things and I was thinking that I reallly don't do any of that stuff. I like it other people's homes, but that is not my style. The things I love are pictures hanging on all the walls. I love that and have done it in every house I've ever lived in. I love for the clothes to be clean and put away. That means so much to me. And, I love my gardens and yard to be beautiful and clean. I love the smell of fresh sheets off of the line that smell of sunshine. I also love my birdfeeder and watching the little birds come and go from it. I love pretty things and the simple touches that make them that way. I have several tablecloths that I like to use and I love. love bowls for some reason? A pretty serving bowl just makes me smile almost as much as something sparkly! Dear Vicky, There are probably people who dont know how sunshine smells on linen. But nothing is better. I love jugs, bowls, TUREENS! and silverware... love! Did I mention platters! I love them! I will be printing this post, it is so beautiful. I love fresh air and to have the windows open and light pouring in. I love flowers on the table and fresh linens. I like things to be pretty, too. I love baking and the smell of it, and the delight it brings to those who partake of it. I love when Colton walks through the door while I'm cooking supper and asks what smells so delicious. For decor, I love things that have a story or bring back a memory. I like the look of things slowly collected over time, and they don't have to match. Old, vintage, antique things are what I like, but my favorite things are the things Colton has built. And this may sound silly, but I love looking out the window and seeing my pets, or being greeted by them when I walk outside. A fluffy cat on the porch just seems homey to me lol. Thank you for all the inspiration, Annabel. It is just lovely. Thank you! Order... is a good word. There is peace in order and also in routine I think. Clutter brings me stress also. And confusion. I am pretty sure it is draining to most of us. Hello Annabel, I haven't read everyone's comments yet, which I like to do so will come back, I'm almost ready for wednesdays post! Anyway everything you say resonates with me. I get such a kick out of a nice homey tidy space and gorgeous touches. Cleaning is an evil necessity, why not make it fun. 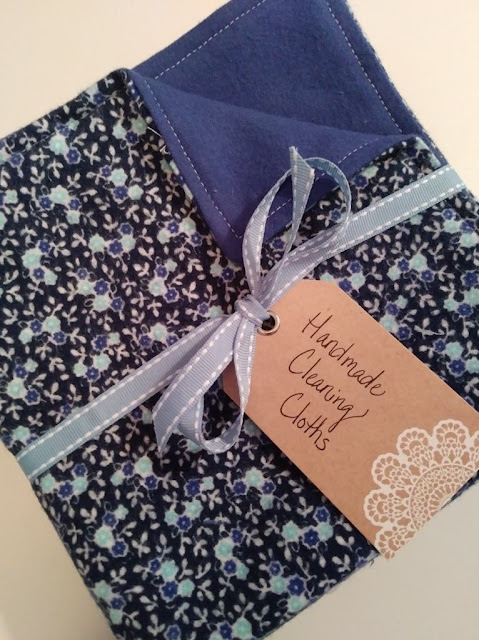 I have just made myself a batch of cleaning cloths, I have used the rolled hem feature on my new overlocker and they are lovely, made out of old sheets, actually offcuts from the wombat and kangaroo pouches i've made. that also gives me a kick, making do with something that already exists. There used to be a saying "cleanliness is next to godliness". true huh. Dear Fiona, Oh my goodness I would love the rolled hem feature! I could go crazy with that! I love cleaning cloths and also handkerchiefs! Absolutely LOVED this post, Annabel...you know, in day to day life I don't get to meet many people who share my values, so your blog really is a blessed place to visit for inspiration, truth and encouragement. Hi Annabel,the home iam now is not my own but i make it feel like home without going to to much effort,just recently i found a bathroom cabinet,for $5.00 in a 2nd hand shop that fitted into an area of the bathroom and it looks like it was made for that space,i was asked did i measure the truth is no i just took a guess:)iam waiting till the cooler season for when i can do a refresh of painting the walls again all this why saving like crazy. Dear Melissa, I am after a little cabinet like this right now for my essential oils! I know I will come across one some time! I am a measurement guesser too. This drives Andy mad who says HOW do you know it will fit. I just know! haha! You and I did things in such a similar way. Everything I had was done up somehow by me, painted, made over, made nice somehow... it all came together to make a home. Back then I loved magazines or the ideas and books. Now yes we have the internet! I love the sound of the angel wings! How gorgeous! Effort and love just go a long way... a bit of creativity is pretty handy too. As you say a table cloth has power to upgrade things too! Dusting cloths! These are so good as you are dusting, killing bugs, perfuming your home all at one time. The Home Pharmacy. Sickness in the house. Feather your Nest Friday, 23 February, 2018. The Home Pharmacy. Guest post by Melissa. Feather your Nest Friday, 16th February, 2018. The World Within our Walls. Using what you have. Feather your Nest Friday, 9th February, 2018. Feather your Nest Friday, 2nd February, 2018.